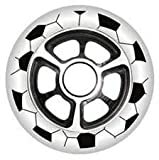 Yak FA Spoke Metal Core Scooter Wheel 100mm NEW ITEM IN WHITE , selling for $19.99 brand new. Manufactured by Yak. There are 1 units left brand new. NEW Design NO BEARING CUPS NEEDED! Stronger! BLACK: New wheel, new design, new specs, new level of performance, blows away everything you know about scooter wheels. Printed both sides. 85a super high performance urethane gives better grip, better bounce, better roll. New hub design is unique and unlike anything you’ve ever seen. Now available.